Prospect and borrowed scenery are the foundation upon which inner gardens (madang) are composed and have traditionally served as essential prerequisites in the selec­tion of residential sites, though more as underlying factors than openly recognized conditions. Confucian scholars who lived in the mountains and forests. Son’gyojang in Kangnting City, Kangwon Province, is a typical example of the yangban homes built in the provinces toward the end of the Choson period (in this case, a. d. 1816). 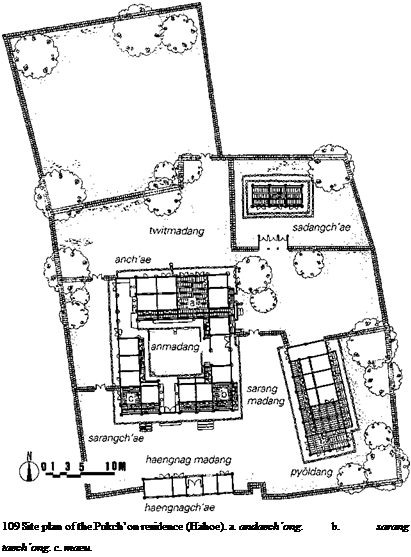 In floor plan composition, it contains all the ele­ments symbolic of the Korean upper classes at the time. Its outer garden, consisting of a lotus pond and a pavilion, lies outside the main gate on flat ground to the southwest of the outer wall of the residential compound, which is formed by the haengnagch’ae (Figures 115.1-115.3). The area of open ground on the slope behind and north of the anch’ae is called the twitmadang, or the rear garden. It is sometimes located at the top of a series of stepped terraces. The significance of this rear garden lies in its role as an exterior space for the leisure activities of the women and children of the household, who traditionally lived in the anch’ae and were forbidden to leave the residential com­pound without good reason. It was a very private space, which men—particularly men from outside the house­hold—were not permitted to enter. In Korea it was traditionally believed that the majority of the design decisions involved in laying out a residence could be resolved simply by selecting a suitable site according to the geomantic principles of p’ungsu. The most desirable sites, known as myongdang land, were on southern slopes, as was mentioned earlier, with mountains behind them and rivers in front. Borrowed scenery is, by Japanese standards, a natural ele­ment that forms the background of a picture plane in which the actual garden forms the foreground. In other words, borrowed scenery refers to the intentional incor­poration of a distant scenic element—the actual focal point of the garden—against which a garden scene is created in the foreground to complement the greater effect. It is a technique whereby a garden of limited area is set against a feature of a distant natural scene, such as a mountain, to draw a sense of the infinite into a finite environment. Li-ji wu-yu refers to the way in which buildings are to be laid out on the site, and how they are to be constructed. As is indicated by the stipulation “1. Buildings, 2. Flowers and trees, 3. Water and rocks,” the location and position of the various buildings is given highest priority. In Korea, on the other hand, the first step is selecting a site with suitable natural features, after which the layout of the buildings is determined so as to provide the best possible prospect (chomang) and borrowed scenery (ch’agydng). The layout of buildings in a Chinese yuanlin seeks to achieve a reciprocal relationship between each building, creating mutual and intersecting views, whereas in Korea views from one building to another are deliberately avoided. possible within the particular limitations and conditions of a given space. he closest Korean equivalent to the type of residence in China that would have its own ting yuan or yuan – lin is the estate of a yangban (civil or military official), and the factors governing the composition of a yangban resi­dence have been examined in the previous chapter. Although the traditional Chinese residence and the yangban residence differ in layout and form, the hall and courtyard composition of the former is much the same as, and corresponds to, the ch’ae and madang oithe latter. The composition of the ch’ae interior space and madang garden of traditional Korean dwellings corresponds fairly closely to the hall and courtyard composition in tradi­tional Chinese residences. In the same way as a Korean ch’ae consists of pang and taech’dng (or шаги), with the taech’dng open to the madang garden, the halls of Chinese dwellings are com­posed of private rooms and communal living rooms, or tang., which open onto the yuanzi or tianjing courtyard. In other words, in both Korea and China, the courtyard “garden” serves as an outdoor extension of the adjoining room, and is in no way an ornamental garden for viewing from indoors.